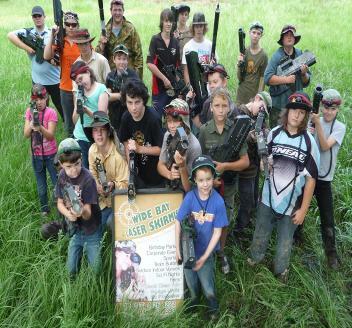 Wide Bay Laser Skirmish is locally owned and operated in the Wide Bay Region by Phillip and Rhonda Kay of Apple Tree Creek, near Childers, QLD. Phillip, a radio technician by training, has been involved in the telecommunications and entertainment lighting industries for over thirty years. Phillip (aka Chewy) is the Communications and Armoury Officer, who ensures the guns are in good working order for each mission as well as being the Commanding Officer of Wide Bay Laser Skirmish. 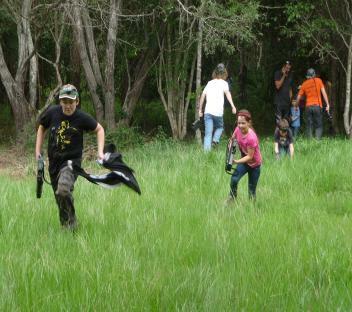 Whilst in search of an adventure activity for their sons, Phillip and Rhonda discovered Laser Skirmish over ten years ago in Brisbane when laser skirmish was just starting out. Their sons Timothy and Benjamin still play regularly. The boys have had so much fun shooting each other and especially their mother that the family decided to set up Laser Skirmish in the Wide Bay Region for all to enjoy. Rhonda, who originally trained as secretary and recreation officer whilst working in a QLD forensic lab and hospitals, recently added to her formidable organising skills with a Diploma in Hospitality Management from Wide Bay TAFE. Rhonda (aka Radar) is the Enlistment Officer and ensures that each Skirmish session runs like clockwork. Tim (aka Wookie) and Ben (aka Top Gun), are ranked players. Tim is a Field Commander running the battlefields and missions each week. Ben is a Medic responsible for providing replacements and backup on the field. Their daughter Meghan (aka Elmo) is currently on deployment in Brisbane area helping with another battlefield “Laser Assault” on the Sunshine Coast. After ten years, the Kay Family is excited and looking forward to sharing the Laser Skirmish experience with everyone. So, together with sons Tim and Ben, Phillip ensures that all players have a great time.